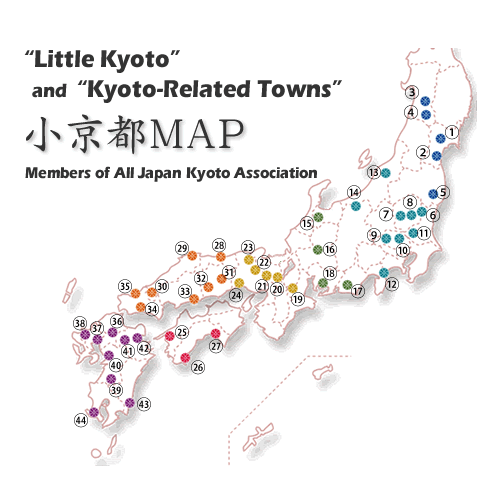 "Little Kyoto" TOPPAGE | All Japan Kyoto Association"
'Sightseeing Highlights' , 'Important Annual Events' , 'Traditional Crafts' and 'Food & Specialties' – Full of information about 'Little Kyoto' and 'Kyoto-Related Towns'! The All Japan Kyoto Committee was launched in May 1985. It was started with Kyoto and twenty-six cities and towns all around Japan which were called "Little Kyoto" at that time. The goal of the committee is for Kyoto and associated cities/towns to cooperate with one another and publicize their rich historical and cultural attractions. As a result, the city's image and its attraction to tourists will be enhanced. As of April 2019, forty-four cities and towns belonged to the committee. 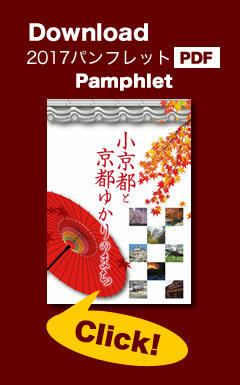 The member cities and towns address the broad area of tourism promotion together, such as by producing and distributing brochures and posters. Additionally, the committee holds an annual general assembly, hosted by one of the member cities or towns in turn.